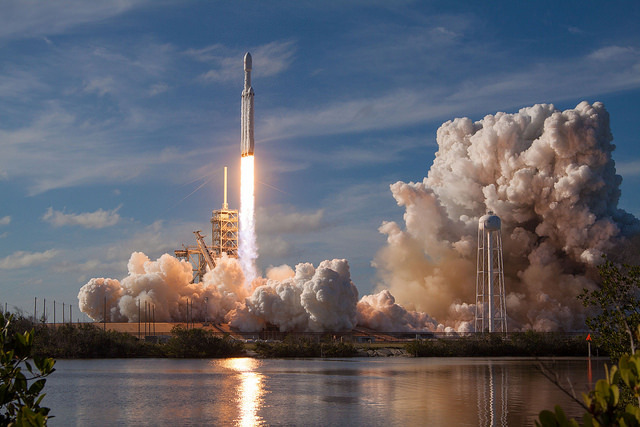 The launch of the Falcon Heavy , which took place on Feb. 6th, 2018, was an historic event. After years of preparation, SpaceX successfully launched the heaviest vehicle in its arsenal, which has a lift capacity that is over twice as much as the next heaviest rocket (the United Launch Alliance’s Delta IV Heavy). The launch also demonstrated SpaceX’s commitment to reusability, where two of the three cores were recovered afterwards. In addition, the launch was a media frenzy as the heavy rocket deployed some very unusual cargo – a Tesla Roadster with Starman (an empty spacesuit) in the driver’s seat. In honor of this event, the company has released a video that showcases the highlights of the launch. Consistent with the theme of the launch, the video was set to David Bowie’s 1971 hit “Life on Mars”, and is quite emotional to watch! The video begins by showing the crowds assembled outside of SpaceX’s launch site at Space Complex 39A at Cape Canaveral, Florida. We then see Elon Musk’s Tesla Roadster and Starman being loaded aboard the Falcon Heavy payload capsule. What follows is the rollout of the Falcon Heavy at Cape Canaveral, its deployment on the launch pad, and the rocket blasting off. This is where things get emotional as Bowie’s song hits a crescendo and people on the ground and in the launch complex celebrate the successful launch. We are also treated to some footage of Starman and the Roadster being deployed once they reach orbit. As Starman floats in full view of Earth, we also see the successful recovery of two of the Falcon 9 cores, and the crashing at sea of the third. While the video manages to cover all the major aspects of the launch, the real focus is definitely on the people who witnessed the event. As the video plays, you can see the anticipation and hope as the rocket is preparing for launch and the sense of elation that came from its success. This is in keeping with Elon Musk’s vision for SpaceX, which he founded in 2002 to inspire public interest in renewed space exploration. Of course, one can’t forget how the launch also signaled that SpaceX is one step closer to achieving Musk’s other dream – which is to reduce the cost associated with space launches by making rockets fully reusable and restoring domestic launch capability to the United States. Now that SpaceX is capable of lifting 64 metric tons (141,000 lbs), NASA won’t have to depend on Roscosmos to send crews and heavy payloads into orbit much longer. And of course, the deployment of a car into space, which is expected to remain in orbit of Mars and maybe even return to Earth someday, was pure media gold! Awesome video – Great to finally see footage of the center core hover slamming into the ocean. I am wondering if this is actual footage or footage of a different launch and booster crash landing? Funniest comment I saw was at spaceflight now on the live feed someone said they wore out their mouse hitting refresh to try and learn the fate of the FH center core..